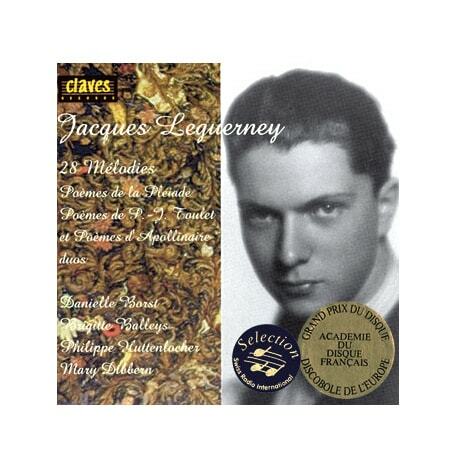 (Winner of the Academie du Disque Français's Grand Prix du Disque; Official Selection of Swiss Radio International) A protégé of Francis Poulenc and Nadia Boulanger, Jacques Leguerney (190697) was known as a composer of art songs, often drawing upon classic French poems for his texts. Comfortable among the modernists, Leguerney nonetheless wrote in a defiantly late 19th-century style without sacrificing his originality. The winner of the Academie du Disque Français's Grand Prix du Disque and a selection of Swiss Radio International, this 1996 disc features the talents of three Swiss singers: mezzo Brigitte Balleys is included here, while soprano Danielle Borst and her husband, baritone Philippe Huttenlocher; duet on Signes and De l'abime profound. Among the other selections are Deux melodies sur des poèmes d'Apollinaire and five sets of Leguerney's Poèmes de la Pléiades. The liner notes include photographs, lyrics in French, and an appreciation of this neglected yet masterful songwriter.